Sharon Lorenzo gives her perspective on this passionate artist. In 2018, the Victoria and Albert Museum in London featured as its annual tribute to the art of fashion a show entitled, Frida Kahlo: Making Herself Up. Curators at the Brooklyn Museum have tagged on to this effort and expanded the exhibition to include their own array of photographs, costumes and Pre-Columbian art to produce a 325 work show embracing Frida as the classic idol of self-disclosure, torment, pain and Mexican modern painting. In an age where we now have a Frida – Barbie doll and Mexicanidad art in so many forms, this show is fun and entertaining with film clips and a gift shop full of tokens, books and films of the icon of the Me Too movement for women in Mexico and beyond. Nickolas Murray, Frida on bench, 1939, Carbon Print. Frida was born into a mixed heritage family of Guillermo Kahlo and Matilde Calderon y Gonzalez, the mother from Mexico and the father of German descent. When Frida contracted polio at the age of six, her health was challenged but she survived with one leg shorter than the other. She was once again injured in a bus accident at the age of eighteen when a rod pierced her abdomen and spine. 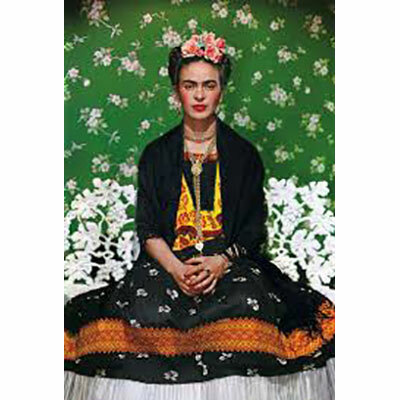 Her father, who was a professional photographer, set Frida up in her bed with paints and canvas to allow her to rest but keep busy during her recovery. Thus, her life in the visual arts began along with the pain, and the two tracks continued throughout her forty-seven years until she died in 1954 from a blood infection caused by the nails in her spine. 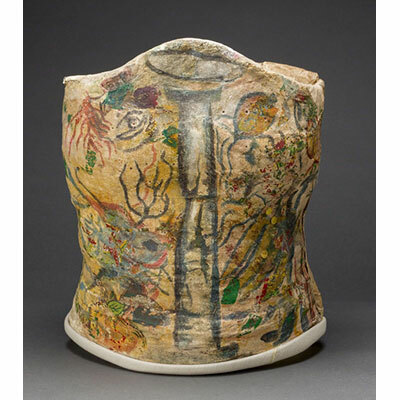 The show features some of her corsets which she painted during her confinements and recoveries. Plaster Corset, Painted and Worn by Frida Kahlo. Many of the items in the exhibition were found in a closet in the home where Frida lived in Mexico City with her husband, Diego Rivera. The Casa Azul is now a public museum worth visiting for sure. 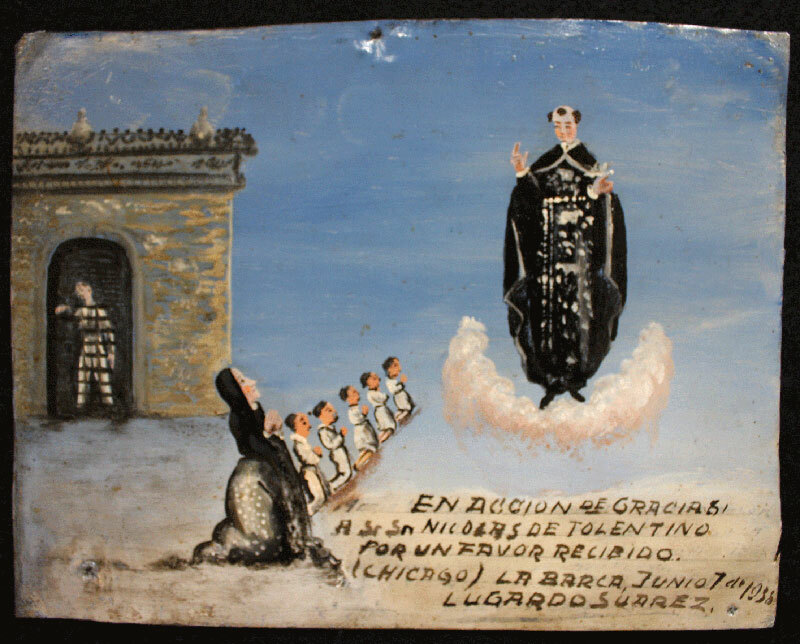 One can see there some of the items lent to the show like the marvelous collection of “ex-voto” devotional paintings which Frida assembled during her lifetime. People made these small works and gave them to the local churches as offerings in supplication for help and prayers from the clergy. Work on tin, Collection of the Frida Kahlo Foundation. This photo included with many others in the exhibition is by Lucienne Bloch. 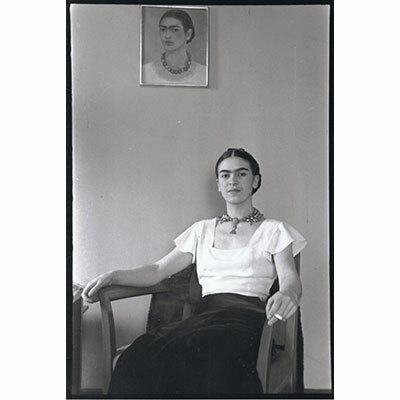 Taken in New York City in 1933, it shows Frida in her relaxed mode with a self-portrait she painted on the wall in the background. It is part of a complex tale that caused great trouble for both Rivera and Frida in their marriage and careers. Lucienne Bloch, Frida Kahlo at the Barbizon Plaza Hotel, 1933, Black and White Photo, Gelman Foundation. Having completed a major mural cycle in Detroit at the Institute for the Arts for industrialist, Edsel Ford, Diego Rivera came to the Museum of Modern Art for a show of his work in 1931 at the request of Abby Rockefeller, its founder. At this time one of her five sons, Nelson Rockefeller, had finished his studies at Dartmouth College in 1930 and was working for his father on the huge program of new buildings to be named Rockefeller Center. One of Nelson’s jobs was to supervise a mural commission from Rivera for their central entry space on Fifth Avenue. When Rivera included a portrait of Lenin in this large mural work, the planning team objected, as their clients like Chase Bank and Standard Oil did not want a Communist in the lobby. Correspondence in the Rockefeller archives in Tarrytown, New York includes letters from Nelson suggesting that Rivera substitute a portrait of Lincoln for the one of Lenin. Rivera replied that he would consider it. He went home to Frida and she was furious, as they were both active members of the Communist party in Mexico. Rivera went back to Nelson and said Lenin had to stay, and the Rockefellers covered the mural in May and destroyed it in February of 1934. Diego and Frida returned to Mexico City, where Rivera was so angry with Frida over the destruction of his mural that he began a relationship with her sister. They ultimately divorced for one year from 1939-1940 before remarrying again in the Casa Azul. The biography of Frida by Hayden Herrera explains that when Rivera and Frida and moved back in together, Frida continued to paint until her health failed, and she died in 1954 from a blood infection. One of my favorite works in the show is one of Frida’s most seminal works entitled, Love Embrace of the Universe from 1949. 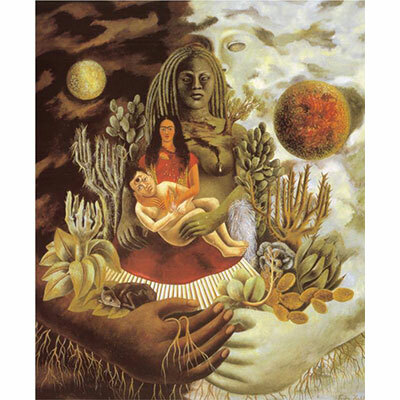 In this painting we see Frida and Diego reunited with their hairless dog, Xolotl, in the arms of the earth, moon, sun and a lactating mother. With one white arm and another with dark skin, we see Frida embracing modern interracial marriage as a universal truth. 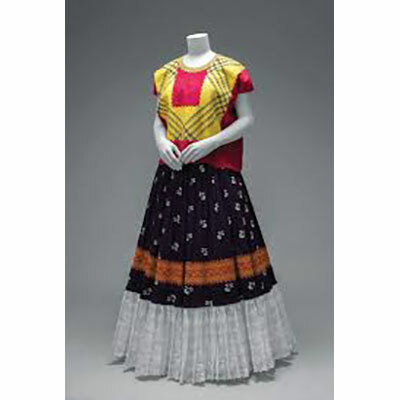 The flora and fauna of the Mexican culture are noted in each cactus and specimen. The composition is captivating and engages the viewer in her biographical references and story-telling modality. Love Embrace of the Universe, 1949, oil on canvas, Jacques and Natasha Gelman Collection. This exhibition is accompanied by labels of each object in both English and Spanish to welcome a diverse community of visitors. Even the restaurant in the museum has a menu of Mexican favorites designed specifically to accompany this exhibition which can be viewed until May 12th of 2019. 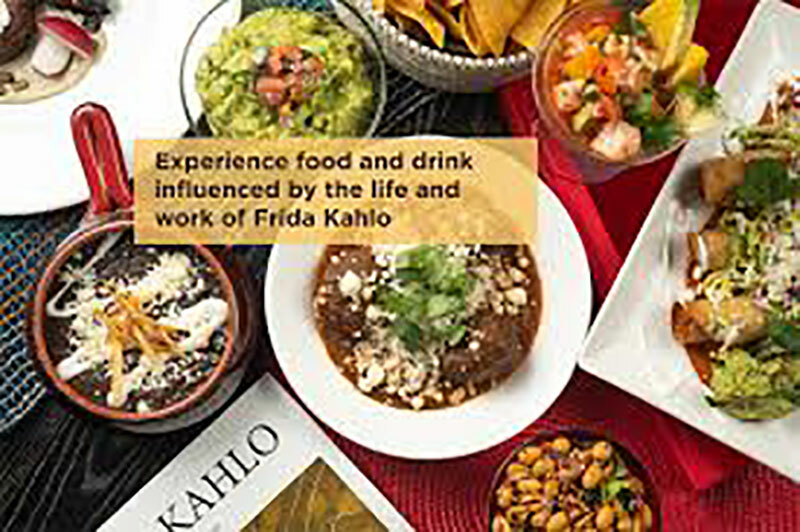 Reservations for both dining and visiting the Frida show can be made on line for timed entry to both. There is something for every member of the family to enjoy in this entertaining and informative effort by the newest director of the museum, Anne Pasternak, another icon of feminine leadership and artistic vision. 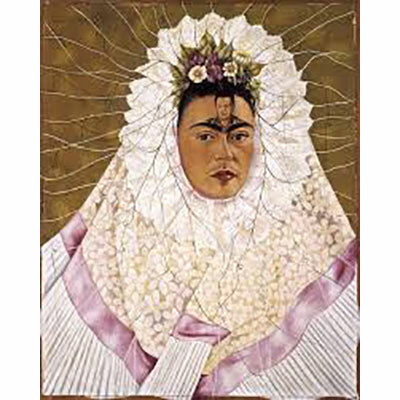 Frida Kahlo, Self Portrait as a Tehuana, 1933, Oil on board, Gelman Collection.